Zoya‘s Jem was in my untried pile for so so long! I believe even over 3 years! I don’t know why to be honest. It’s such a beauty which was on my wishlist for quite some time. I think this was part of a swap that I did with Miss Holly Berries ages ago. Thanks a bunch girl! Let’s take a look: In real life it’s slightly a darker purple than my photo’s show. My camera is sometimes having a hard time with capturing purple/blue hue’s. This is such a gorgeous shade! The shimmer is amazing. I applied two easy coats plus top coat here. I topped my accent nail with one coat of Baby Boom Galaxy and a matte top coat. 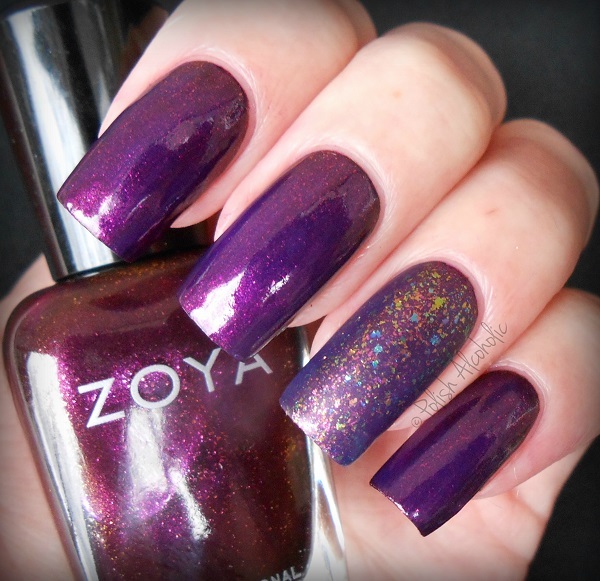 This entry was posted in ZOYA and tagged review, swatches, zoya, zoya jem by Polish Alcoholic. Bookmark the permalink.